We can't wait to get our hands on this new product! Bumble and Bumble is gearing up to release their Scalp Detox and we're sure it's going to be one of our new favorites. Knowing that clean scalp is the foundation for both great hair and styling, this cooling, fizzling foam is perfect for removing buildup. If you love dry shampoo or co-washing, this is the product for you! So, how does Scalp Detox work? As you section your hair, simply dispense the product into your scalp. Then, use your fingers to massage it into the roots of your hair. It's mix of Micellar Water (to cleanse), Salicylic Acid (to remove pore-clogging debris), and Pathenol (to prevent dry-out) all create a tingling sensation that leaves your scalp feeling healthy and refreshed. Apply it weekly to refresh your scalp, or just to enjoy the tingly microbubbles. Anxiously awaiting it's release, we'll be sure to let you know when it's available for purchase in the salon! Bumble and bumble has outdone themselves again! Welcome the two new additions to the Sumo family: Sumoclay and Sumogel! 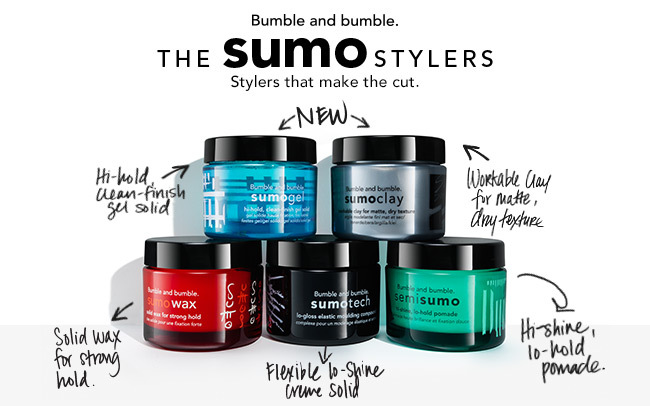 Sumoclay solves your limp, dull hair problems in one little jar! It is a light weight styling product that adds texture, definition, and bulk. It should be applied on dry hair only as it adds shape and detail. This product is ideal for all hair types, including fine-to-medium hair to add body and texture. Sumogel eliminates the flaky 90s gel style! This styling product is a crystal clear, solid gel that does not crunch or flake. Giving your hair that natural shine and clean finish it deserves! Sumogel is best used on wet hair and combed into place. With its innovative Micro-Emulsion Structure technology, you get that shine without any heavy silicones! How do you keep your hair and skin looking and feeling amazing, even with the drying winter air and the freezing temperatures? HYDRATION is key! Lack of moisture is one of the main reasons that our hair looks brittle and frizzy, and that our skin looks cracked and peeling. But don't worry - we've got the products and tips you for the absolute best, hydrated hair and skin possible. A highly concentrated balm-to-oil weekly masque that you apply to dry hair before you shampoo, to provide parched hair with an extra dose of moisture. Tip - Scoop out the product and warm it between your hands to melt, and apply evenly to dry hair. Dry hair tends to absorb moisture better than wet, so apply this masque about 20 minutes before you hop into the shower for maximum effect. This mild, hydrating shampoo and conditioner helps replenish dry and damaged hair. Tip - After shampooing thoroughly, condition and let sit for 1-3 minutes. This gives the conditioner time to work its magic! The innovative masque material used in the Patchology Hydrating Flash Masque delivers Hyaluronic acid and Vitamin B5 much faster than traditional sheet masques. in about 5 minutes, you can have the mega moisture boost that your dry winter skin has been craving. Tip- After removing the sheet masque, don't rinse off the extra serum left over. Let it fully absorb into your skin, to leave you feeling hydrated and refreshed for hours to come. Fuller, Stronger Hair Has Arrived! Bumble & Bumble has introduced three new products this season: Hair preserving shampoo, hair preserving conditioner and hair preserving booster spray. The Hair Preserving Shampoo is great for anyone that is looking for fuller, stronger hair, especially those prone to breakage and thinning. This shampoo acts as a bandage to promote strength and elasticity. The Hair Preserving Conditioner is lightweight and nourishing. It instantly reinforces strands, making your hair feel plumper and healthier. The key ingredients in this powerhouse of a conditioner include energizing creatine, and invigorating menthol that offers a cool, tingling sensation. The Preserving Booster Spray starts at the scalp and acts as non-physical exfoliant (just meaning that it exfoliates without leaving any annoying grit behind in your hair!). It helps take away sebum residue and other debris to leave a clean scalp behind and gives strands an optimal environment to thrive. This spray is a highly potent restorative spray that reduces breakage by 46%. You are guaranteed to see results in as little as four weeks. I don't know about anyone else, but this product sounds awesome to us here at the salon. Being able to have fuller and healthier hair just by using these three items! It sounds so simple who wouldn't want to try it?! I personally have fine, damaged hair and I have noticed a significant difference in my hair after using these 3 products. My hair feels much thicker and healthier after just three weeks!